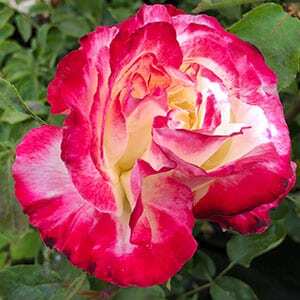 Double Delight Rose | Nurseries Online. The Double Delight Rose is one of the best selling roses in the world. Available as a bush rose as well as a standard it has great fragrance and is in the ‘Rose Hall of Fame’. A very fragrant rose Double Delight has green foliage and two-tone cream and crimson red flowers that change colour with age. The proportion of red increases with the age of the bloom and the amount of sun it gets. Picking the blooms ‘freezes’ the colour balance. The red colour takes over as the bloom ages and also as its exposure to sun increases. Colour will not change once the individual flower is picked. Double Delight is a rose that can be a little slow to ‘get going’ and will only form a small bush to 1m or so. Well worth the effort as the fragrance is excellent and the flowers attractive. Mildew can be a problem in autumn so ensure good air circulation. Neem oil sprays or a solution of 3 tablespoons of baking soda and a few drops of liquid dish detergent in10 litres of water are solutions. This is a rose that works best when used as a feature plant, the flowers and the fragrance demand this sort of attention. grow it near the front of the border or in a container on a patio..
Best grown in a position with good air flow and low humidity, also best in full sun or at least 6 hours of good sun a day and a well drained soil, water your new plant well the day before planting and you are ready to plant. We suggest using a general purpose rose food such as Sudden Impact for roses with an application every 8 weeks from early spring through summer. 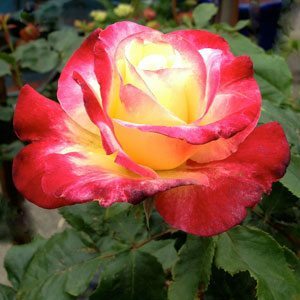 Regular seaweed fertiliser application will also help keep you Tequila Sunrise Rose Bush flowering freely.